By Mike Hubbartt, Copyright 2011, All Rights Reserved. This brief tutorial is meant to help people get started writing their first Ruby program using the Eclipse IDE. Step 1: See if Ruby is already installed. Ruby does ship with some operating systems, however it is available for multiple operating systems here. To verify it is installed on your Linux computer, open a shell and enter ‘irb’ and , enter a simple Hello World program like ‘puts “Hello Ruby on Linux!”’. If you have a Windows computer, you need to download and install Ruby, then follow the instructions to test Interactive Ruby on Windows here. Download and install Eclipse if you don’t already have it. Select –All Available Sites– for the ‘Work with’ drop down list. Expand the Programming Languages section and select ‘Dynamic Languages Toolkit – Ruby Development Tools’. Press the Next button, review the options, then select the Finish button. Use the IDE ‘Eclipse/Preferences’ menu option to pull up the application preferences dialog, then select ‘Ruby’ on the far right of the dialog. Expand the options under ‘Ruby’ and select ‘Interpreters’. If none are displayed, select the ‘Search…’ button at the right side of the screen to locate any installed interpreters. Apple ships a ruby interpreter – in OSX 10.5.x I found them in /usr/bin/ruby. Now use the IDE ‘File/New/Ruby Project’ to create a new Ruby project. Name it to any convention you follow (type of project, class, etc.). NOTE: You want to use the Ruby Perspective when writing Ruby code, which is available using the IDE ‘Window/Open Perspective/Other’ option and selecting ‘Ruby from the list. Save and execute the file and verify you see the text string in the Eclipse console. Congratulations. You just created your first Ruby program using Eclipse. Launch Eclipse, then locate and install the Ruby Development Tools plug-in using the Eclipse ‘Help/Install New Software’ menu option. I added the three steps I followed to add Ruby support to Eclipse to the procedure. Please let me know if this was adequate. Creating this class with the puts statement does not work on my installation. The generic ‘print’ does. Not sure as a newbie what it different but maybe this needs to be refactored. I’ll see if I can help if you can provide more information. 1. Did you use ‘puts’ in the examples in step 1, step 2, or both steps 1 & 2? 2. Which OS are you running? I’m running OSX 10.6.8 and ‘puts’ works but ‘put’ does not. 3. Another thing to check: which version of interactive Ruby are you running? 4. Which IDE are you using, and which version of that particular IDE? i got this problem when i try to run the hello.rb code. Problem Occured: Testing Engine not configured for this launch configuration. Could you do Step 1 in this post to verify Ruby is installed? I do not have Lion installed to be able to test, but maybe one of our readers running Lion will be able to help. Use the IDE ‘Eclipse/Run’ menu option to pull up the Debug Configurations dialog, expand Ruby Test, Select Hello.rb and pick “Test::Unit” from the Ruby Testing Engine selection. Apply your changes and debug the code. I’m using OSx Lion and eclipse indigo, but when i execute the program nothing appears in the console. Click on the Console tab to view the results. I guess one has to instantiate the object and call the method as shown by RubyFan above. This posting is useful, but the code should be fixed as shown above. But did you try to edit .erb files with it? It doesn’t work. It works only for “class A end” and “def b end” things. Almost any editor can do it. Clear and nice post for Ruby. I am neebe for ruby. I have iMac. But eclipse not installed. 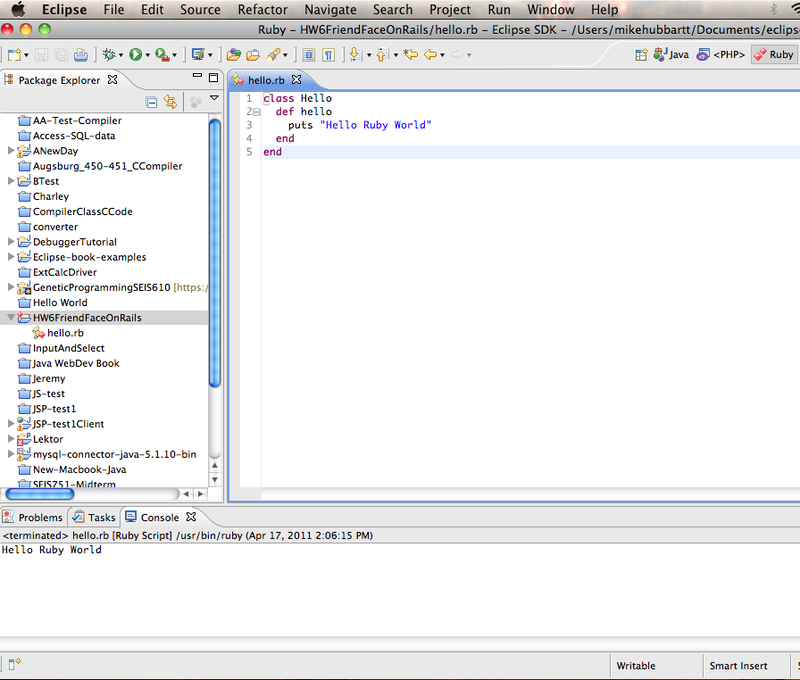 Now am using Eclipse -Indigo in windows 7. I have decent knowledge in PHP..I willing to know Ruby.I will try now. For ruby development guides need your support. Thanks in advance. Good post. I’ll refer it. Everithing works fine with the right ruby code. Congrats.